How Does Your Mansfield Garden Party Grow? One look at this book and I was smitten. I fell for the undeniable charms of the pattern "Cinnamon Girl" and the yarn "Rosebud" from Juno. I simply had to have these treasures to love and to cherish. Loop Knitting delivered the goods swiftly. Cheerily I skipped off to Ravelry and organised a knit along of "Cinnamon Girl" with a fellow knitter starting today. And then my pink bubble burst. Experienced knitters feel free to cackle and hoot at my naivety. I saw the complexity of the pattern and I grew fearful. I know little of provisional cast-ons and the rest of the mumbo jumbo which ensues. Am I ready for this? Or is this a case of 'marry in haste, repent at leisure'? Is there a benevolent soul out there willing to hold my hand through this daunting ordeal, please? Today is my youngest's second birthday. I love this special date of hers. She had the good grace of arriving a few days earlier than expected.﻿ MInutes after she was born the midwife cheerily asked me which name we had chosen for our baby. "Angélique", I blearily replied. "How wonderful", she exclaimed with a broad smile: "today is Saint Angélique's name day!" How wonderful indeed I thought. You chose your day wisely, dear child. There is no doubt that January 27th falls in winter and for those who are beginning to know me you will understand that this fact delights me. The end of January however is on the cusp of change. If you remain still you may hear spring quietly urging you to be patient for just a little while longer. We celebrate Angélique's birthday with one foot firmly planted in winter's domain and in the knowledge that spring will soon tune up the dawn chorus, lay down a mossy welcome mat, and unlatch her ornate green doors. And if our gardens are mostly barren (not so much the case this year, I hear you say) I am determined to celebrate this important day by bringing flowers into this simple home of ours. So today I fill my youngest daughter's arms with cut hyacinths to herald the glorious months to follow. Please forgive the blurred picture; it must be the heightened emotions getting in the way! And if a wreath of hydrangeas seems a strange gift for such a little girl I should add with a big beaming grin that it is a lasting treasure to celebrate a charming soul who has become my very own garden muse. "And after all the weather was ideal. They could not have had a more perfect day for a garden-party if they had ordered it. Windless, warm, the sky without a cloud. Only the blue was veiled with a haze of light gold, as it is sometimes in early summer. The gardener had been up since dawn, moving the lawns and sweeping them, until the grass and the dark flat rosettes where the daisy plants had been seemed to shine. As for the roses, you could not help feeling they understood that roses are the only flowers that impress people at garden-parties; the only flowers that everybody is certain of knowing. Hundreds, yes, literally hundreds, had come out in a single night; the green bushes bowed down as though they had been visited by archangels." To be honest when I look at this cardigan I see snowdrops, muddy earth, pink and blue hyacinths. I must confess that I like the fact this variagated yarn makes my cardigan look rather homespun... or should that be gardenspun? Angélique certainly loves it in a hopping, skipping kind of way and it suits her beautifully. Tiny Tea Leaves will be taking second position in my Ravelry 12 Sweaters in 2012 project and you can see it on my Ravelry profile. So in answer to the question: 'How does you Mansfield Garden Party Grow?' My answer is 'quite splendidly, thank you'. Happy Birthday my dear child. You have made us all very joyful these past two years. Be mindful however for you are still, I believe, under guarantee! 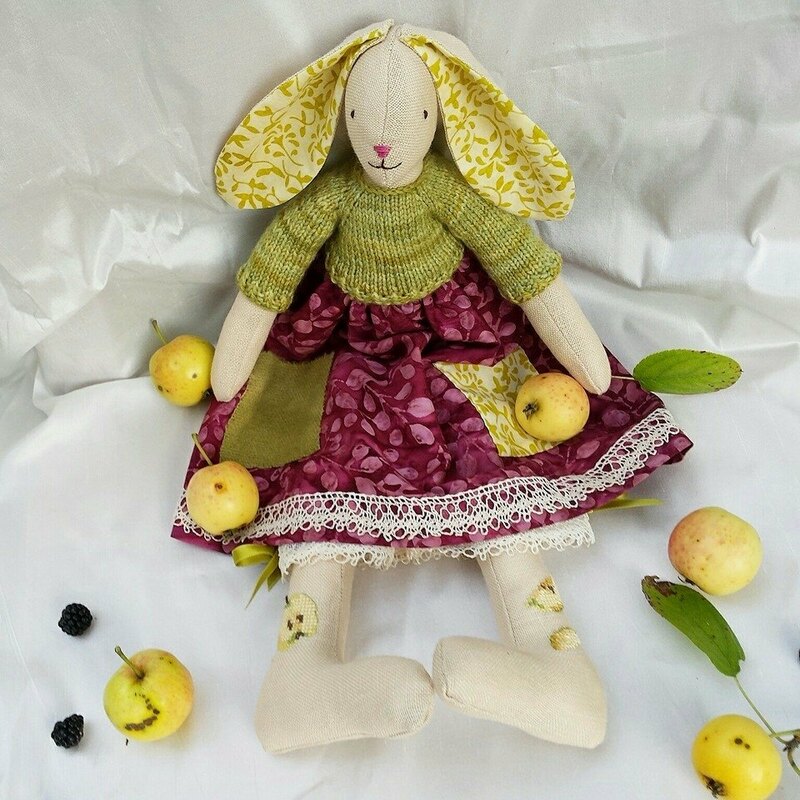 I am deeply grateful to Lori for this adorable rabbit she gifted us as part of her giveaway. Angélique sleeps, eats, and reads with her each and every day. She has been named... "Eek" by her owner Angélieek! Please pop over and visit Lori's pretty blog which is bursting with creative talent. I am certain you will be impressed! Wishing you a peaceful, joyful weekend. Dearest dog lovers I am so grateful for the time you took to write down your thoughts on which breed we should take. Every comment has been carefully read and we are still mulling over this big decision. Thank you so very much! I never cease to be touched by the kindness and patience of those who stop by this space of mine. The title-page of John Taylor's embroidery and lace design book, first published in 1624, depicts an elaborate garden with raised flowerbeds and ornamental flower pots and vases. In the foreground of this garden scene three alegorical female figures are clad in high-fashion costume. Wisdom, in a brocade gown and high ruff, reads a devotional or moralising manual while Industrie works on a cushion, having completed the undergarment to her right. Follie is empty-handed. If such embroidery books represented high-ranking women, whose virtue could be displayed in their artistic needlework, the great majority of gardening manuals targeted high-society men. 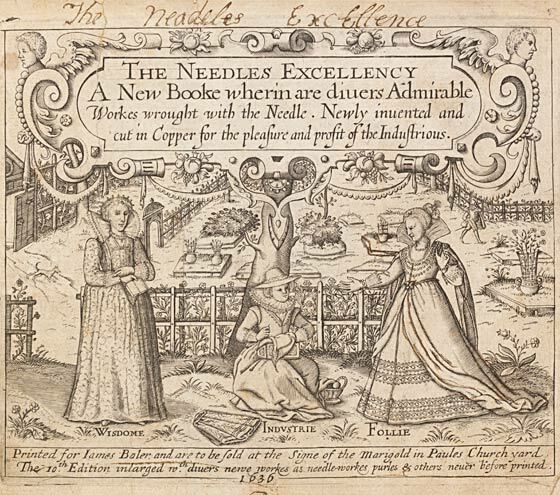 The visual impact of needlework and gardening is important but whereas men clothed their pleasure gardens outside, women clothed their households and garments. Male/female divide aside, there exist many similarities between gardening and needlework handbooks. For example, whilst seventeenth-century writers of women's manuals recommended hand-worked clothing as a public sign of a woman's skill and virtue, contemporary horticultural publication claimed that to tend one's garden was good for one's soul. On the other hand moralising handbooks frequently considered fashion and flower gardens to be both vehicles of vanity and ephemeral pleasures. 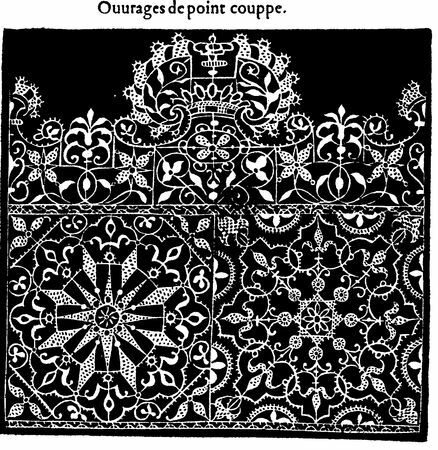 One thing is for sure; the aesthetic characteristics of gardens were thankfully well preserved over the centuries in the embroidery and lace design books which depicted many floral and garden parterre motifs - this distinctive genre of seventeenth-century French formal gardening which can be seen in the examples below - suitable for repeating as borders on the edge of various garments. 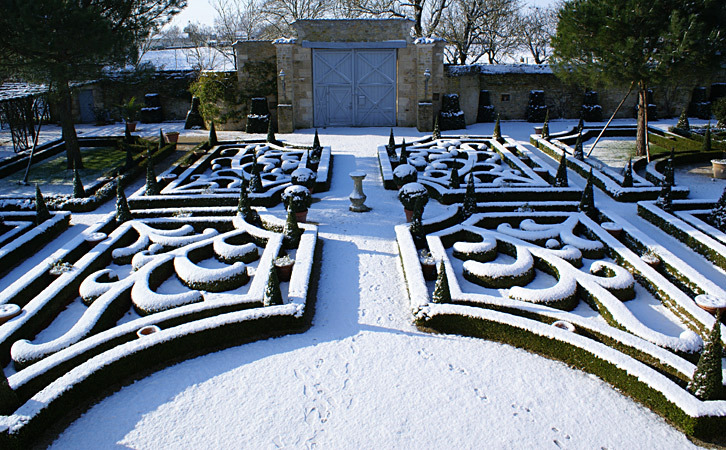 Gardeners sought similar effects to embroiderers in the colours and differing textures they used in their parterre designs. Yellow hued sands, crushed red and brown stones, dark grey metals together with flowers, and plants were mixed to set off the vivid green of the frequently used box tree. According to the Victoria & Albert exhibition on The Needle's Excellency the most popular colours for embroidery were various shades of green, yellow, orange, brown and red. 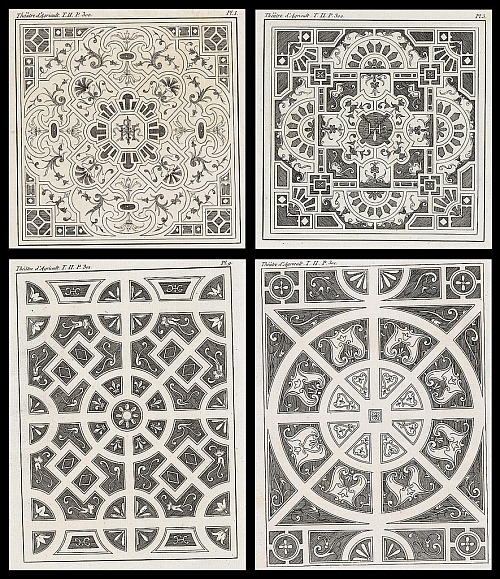 Since gardening treatises frequently recommended that ornamental flowerbeds should be clearly visible from the house it is most natural that young women at court who embroidered would model their designs on the parterres they saw through the window. In winter, after a severe frost or a snowfall, in contrast with the dark earth beneath, these flowerbeds would have looked like the crisp white geometry of the laces which were so fashionable among the gentry and at the royal court. Someone in this parts will be turning two on Friday so I will, hopefully, be posting before then on a truly insane challenge I have set myself AND a beautiful giveaway Angélique was offered by talented Lori over at Hippywitch Crafts. My little girl will not be separated from her at all these days! See you very soon and have a peaceful Sunday. First, I need your help. The die is cast here. My recent visit to a specialist has revealed I am asthmatic - I had strongly suspect this since my bronchitis in October - and that consequently it would be unwise to replace our dear Sakura with another cat. There have been tears from younger members of the family but I believe good must come from this disappointment. My instinct is veering strongly towards owning a dog and my doctor has agreed to this possibility. So please, any advice from you canine lovers would be simply wonderful. Which breed do you love? I have a soft spot for King Charles Spaniel because I know they are gentle with children but my husband Mickaël needs a little convincing! Second, I received a truly inspirational gift while I was away on holiday. Wonderful Annie's amazing giveaway present arrived against the odds just before Christmas and was smuggled in our present stash and transported to our winter destination. I should add that I knew nothing about the aforementionned arrival and smuggling so when I ripped open the Knitsofacto parcel on Christmas Day I was heard making a number of highpitched noises denoting both astonishment and pleasure. Yes indeed. These days the book, Vintage Flowers by Vic Brotherson, has not left the sofa and I marvel at it each and every day. I have decided to use it as a regular inspiration prop here in this space of mine as I would very much like to share its colour celebration with you all. So relish the few pictures below and rest assured there will be more to follow soon with a creative theme woven in. Thank you so much Annie for filling my winter with colour. Now all those who know Knitsofacto will agree it is an inspiring blog indeed. When Annie decided to commit to a Ravelry project to knit twelve shawls in 2012 it got me thinking. I do not have Annie's knitting experience but I felt all fired up. The result? I am now part of the 12 Sweaters in 2012 on Ravelry. If any of you would like to join I would be thrilled to see you there! Let me know, ok? for generously offering Millefeuilles a Liebster Blog Award. It has really touched me and I will be mulling over who I should be passing this special award on to. I think some of you will be disappointed to learn we did not opt for the fairytale roulotte in the snow scene. I am so sorry Melissa! Will you forgive me? We have merely postponed the dream to more clement springtime. Yippee! This family of ours is becoming more earnest about owning our own gipsy caravan when we will finally have a house of our own; a project I hope to share with you on this blog in the future. We spent a week in Le Cantal, near Salers, a dramatic, austere region which is both stunningly beautiful and isolated. Most villages are filled with houses with firmly closed shutters. Many of these are family homes which are now seldom visited for this region does not boast a high employment rate. The thing which struck me the most - and I hope I have conveyed this in the pictures below - is the perfect harmony between the natural landscape and the local architecture. with a generous sprinkling of snow on the mountain. This region is a walker's paradise regardless of the season. One thing I learned to do here was to look at vegetation in detail particularly growing on the stone walls. I LOVE the varied colours of lichen and moss and could quite happily knit in these shades for a long, long time. According to Katherine Swift in a January extract of The Morville Year, "lichens are extremely sensitive indictators of environmental pollution: a rich bloom of lichen means clean air. They also grow infinitesimally slowly - half a millimetre a year is fast - so lichen growth is also an inicator of age. Many lichens will be as old as the tombstones and walls on which they live". The trees, knotted and gnarled and somewhat reminiscent of Arthur Rackham's fairytale illustrations, were also coated with lichen and moss. Yes indeed, Mrs Swift; judging from the lichens I saw the air in Le Cantal is very pure indeed. Here is my eldest daughter, Héloïse wearing her Tea Leaves for the very first time. and willing to pander to our strange whims. This Tea Leaves will be the first cardigan to join the 12 Sweater in 2012 over on Ravelry! I'll be putting up the details on my profile Ornamentation. Thank you so much for bearing with me in this green, brown, grey, and white post. ps There is a giveaway being planned here so watch this space. I promise to share with you the colours and natural beauty of our winter holiday very soon but today I feel compelled to link up with Ginny's Yarn Along over at Small Things. In this space she shares her love of knitting and reading and invites others to reveal which books and patterns are tickling their current fancy. I hope to join the tail end of the current 1705 Madelinetosh Tea Leaves Cardigans over at Ravelry by the end of this week. I am nothing if not original! This pattern was carefully chosen with my eldest daughter Héloïse for her post Christmas gift and is - please listen out for the shrill blast of trumpets - my first adult-sized pullover project to date after two years of knitting. Héloïse was unshakable in her choice of Malabrigo Worsted despite my various attempts at seducing her to choose Madelinetosh. Her choice of colour - Black Forest - was perfect for our holiday destination.... More on that soon. My book, Hoffmann's Nutcracker and Mouse King, was chosen initially for its obvious Christmas season overtones. I wanted to get away from the sugary simplicity of the ballet's libretto (which I love really) and turn to the original fairy tale with its darker, more violent atmosphere. Aside from being a wonderful piece of escapism for these long wintery nights its central message has struck a chord with me and is, I believe, important to all of us. In his introduction to this tale Jack Zipes explains that E.T.A. Hoffmann was never able to discard his middle-class social conditioning to become a free-spirited artist. When he wrote Nutcracker and Mouse King in 1816 Hoffmann had observed how the children of bourgeois families were overly regulated. Zipes writes "they were drilled to behave according to moral and ethical principles that were to curb their imagination". The question that Hoffmann asks in Nutcracker and Mouse King is how to free the children's imaginations so that they may fulfill their desires. It is no coincidence that the parents of the two children, Marie and Fritz, bear the surname Stahlbaum, or "Steel Tree". They are indeed inflexible and made nervous by the threatening figure of the godfather Drosselmeier with his creative mind and eerie stories. And so I dedicate this post to my seven-year old Tristan whose creative energy is a force to be reckoned with (REALLY) although his baroque guitar playing and detailed explanations concerning the composition of the pieces he plays help ease my knotted neck muscles at the end of a day. "A rose red brightly shimmering castle with a hundred airy turrets... the dark, burning colors simply dazzled as they heightened the rosy tint against the white ground. The vast dome of the central building as well as the pyramid-shaped roofs of the turrets were strewn with a thousand gold and silver twinkling stars."